An airworthiness certificate is issued by a representative of the Federal Aviation Administration (FAA) after the aircraft has been inspected, is found to meet the requirements of Title 14 of the Code of Federal Regulations (14 CFR) and is in condition for safe operation. The certificate must be displayed in the aircraft so that it is legible to passengers or crew whenever the aircraft is operated. The airworthiness certificate is transferred with the aircraft, except when it is sold to a foreign purchaser. 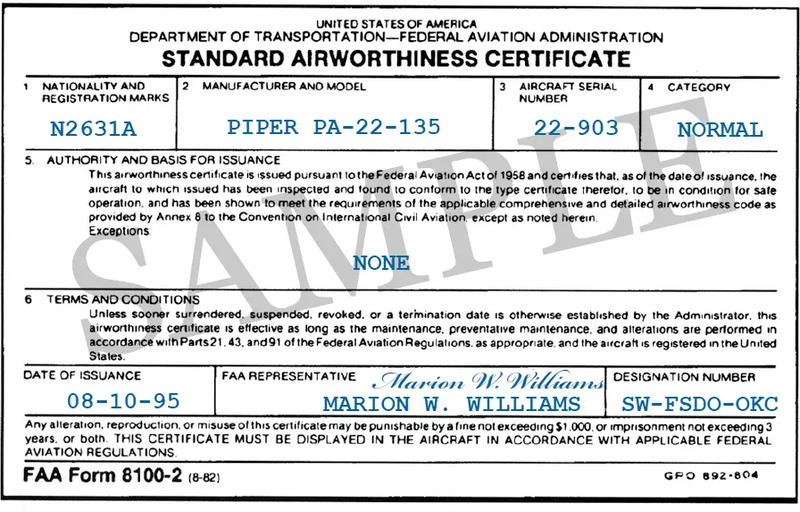 An airworthiness certificate is an FAA document that grants authorization to operate an aircraft in flight. The FAA provides information regarding the definition of the term “airworthy” in FAA Order 8130.2 (as revised), Airworthiness Certification of Aircraft and Related Products (see the first two posts in this section). The FAA initially determines that your aircraft is in condition for safe operation and conforms to type design or American Society for Testing and Materials (ASTM) International standards, then issues an airworthiness certificate. There are two different classifications of airworthiness certificates: Standard Airworthiness and Special Airworthiness. A standard airworthiness certificate remains valid as long as the aircraft meets its approved type design, is in a condition for safe operation and maintenance, preventive maintenance, and alterations are performed in accordance with 14 CFR parts 21, 43, and 91. FAA Form 8130-7, Special Airworthiness Certificate, is an FAA authorization to operate an aircraft in U.S. airspace in one or more of categories in Figure 3-1. Figure 3-1. 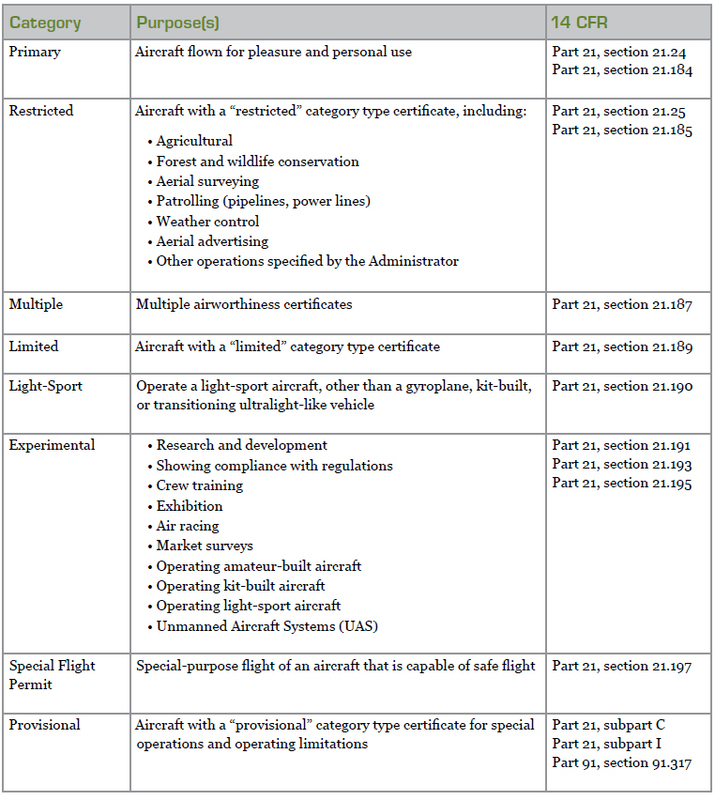 Special Airworthiness Certificate Categories. Only an FAA aviation safety inspector (ASI) or authorized representative of the Administrator (i.e., Designees), as defined in 14 CFR Part 183, Representatives of the Administrator, is authorized to issue an airworthiness certificate. Your local FAA Flight Standards District Office (FSDO) processes requests for replacement airworthiness certificates. You should contact your local FSDO immediately upon discovering that you need a replacement airworthiness certificate for your aircraft. A registered owner may apply for an airworthiness certificate by submitting FAA Form 8130-6, Application for U.S. Airworthiness Certificate, to your local FAA Manufacturing Inspection District Office (MIDO). You can find your local MIDO contact information on the FAA website at www.faa.gov. 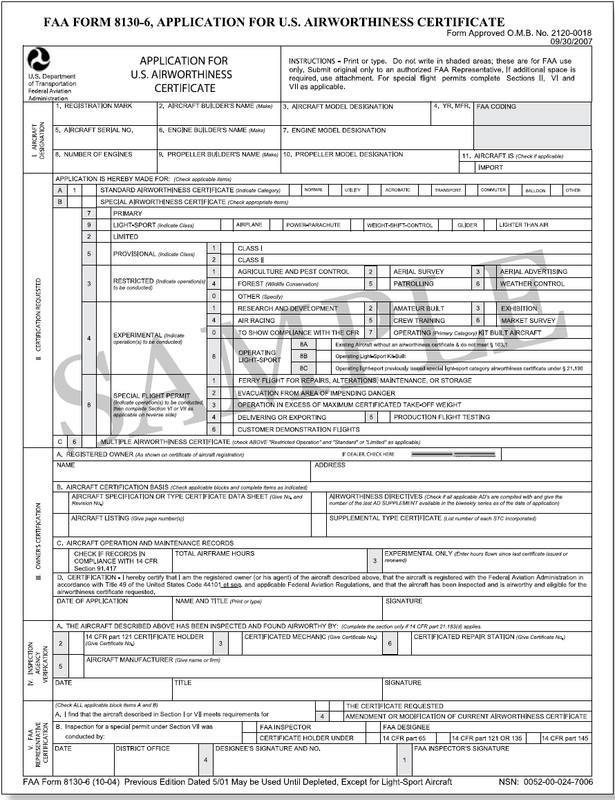 Figure 3-2 at the end of this chapter is a sample FAA Form 8130-6. You can find instructions for completing FAA Form 8130-6 on the FAA website at www.faa.gov or in FAA Order 8130.2 (as revised). The FAA will issue the applicable certificate if the aircraft is eligible and in a condition for safe operation. completing FAA Form 8130-6 on the FAA website at www.faa.gov or from your local FSDO. FAA Form 8100-2, Standard Airworthiness Certificate, is issued for aircraft type certificated in the normal, utility, acrobatic, commuter, and transport categories, or for manned free balloons. The airworthiness certificate remains in effect as long as the aircraft receives the required maintenance and is properly registered in the United States. Flight safety relies, in part, on the condition of the aircraft, which may be determined on inspection by mechanics, approved repair stations, or manufacturers that meet specific requirements of 14 CFR part 43. Figure 3-3 at the end of this chapter is a sample FAA Form 8100-2. Figure 3-3. FAA Form 8100-2, Standard Airworthiness Certificate. The FAA issues FAA Form 8100-2, Standard Airworthiness Certificate, for aircraft type certificated in the normal, utility, acrobatic, commuter, and transport categories, or for manned free balloons. FAA Form 8130-7, Special Airworthiness Certificate, is issued for all aircraft certificated in other than the Standard classifications, such as Experimental, Restricted, Limited, Provisional, and Light-Sport. If you are interested in purchasing an aircraft classed as other than Standard, you should contact the local MIDO or FSDO for an explanation of airworthiness requirements and the limitations of such a certificate. The Experimental Aircraft Association (EAA) is an additional source of information on special airworthiness certificates. 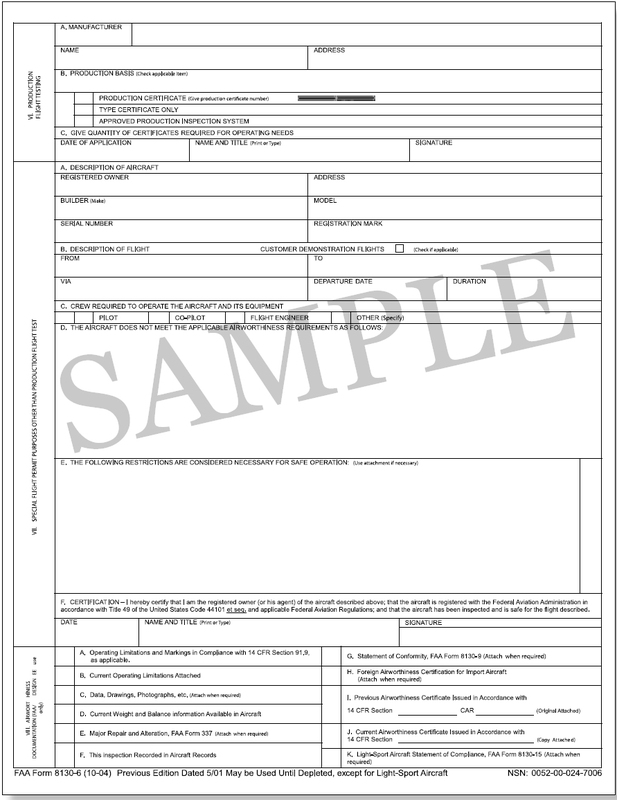 Figure 3-4 at the end of this post is a sample FAA Form 8130-7. Figure 3-4. 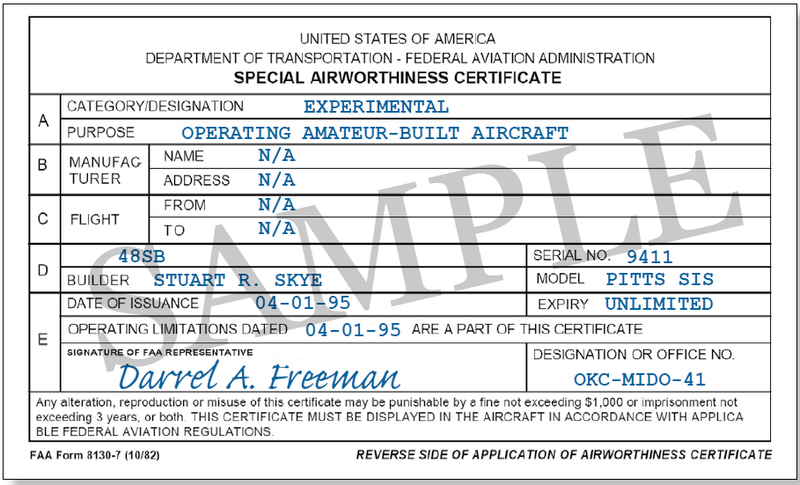 Form 8130-7, Special Airworthiness Certificate. The FAA issues FAA Form 8130-7, Special Airworthiness Certificate, for all aircraft certificated in other than the Standard classifications, such as Experimental, Restricted, Limited, Provisional, and Light-Sport. CAUTION: The FAA can revoke an existing airworthiness certificate in any category (14 CFR part 21, section 21.181), if the aircraft no longer meets its approved design and/or is not in an airworthy condition. There are a number of regulations and policy documents that provide additional guidance on the subject of airworthiness.